Earlier this week, a passenger on a Southwest Airlines flight was accused, in the words of an FBI agent, with "making an obscene and indecent exposure of his person, and a lewd, obscene, and indecent act" while on a Southwest Airlines aircraft. Southwest flight 228 was in route from Philadelphia, PA to Denver, CO on March 1st, when during the flight, male passenger is alleged to have exposed himself and masturbated next to a female passenger. That female passenger had no prior relationship with the accused passenger. For the gory details, please review the criminal complaint which provides more than enough details to paint a nauseating picture of what went on in the aircraft. Many criminal acts that occur on airliners fall under federal jurisdiction, including the alleged behavior of the Southwest passenger, and those convicted of those criminal acts would be punished accordingly. The maximum penalty in this case is 90 days in jail and a $5,000 fine. The passenger was released on bond yesterday, and has been ordered not to fly. The passenger in this Southwest incident did the right thing. She contacted a flight attendant, and the cabin crew took steps to isolate the accused passenger, and made sure that the passenger was arrested after the aircraft landed. If something like this happens to you, or if you suspect that it is happening to someone else on the flight, take action and inform a flight attendant, and if necessary move to another part of the aircraft. What happens after an event like this depends on where you are. 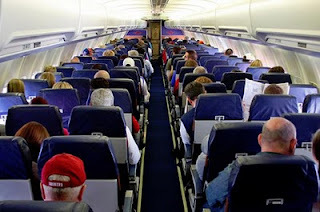 Most countries have laws very similar to that of the US, and it is likely that the offending passenger will be arrested and charged with a crime. In other countries, the story may be completely different, and the police may not take any interest at all. If you come across a situation where a passenger was behaving inappropriately, and no action was taken, about the only thing you can do is make others aware of your situation. You can send a complaint to the airline, the government agency responsible for regulating that airline, or even to the AirSafe.com Complaint System. Children who are traveling alone are particularly vulnerable to the kind of abuse that occurred on the Southwest flight. Unaccompanied children, like all passengers, have no control over who is assigned to an adjacent seat. You should tell the child to contact a flight attendant and change seats if he or she feels threatened by someone sitting near them. In general, the parent or other adult who is arranging travel for that child should be aware of airlines rules on unaccompanied children, or take other steps that will make your child's trip safer.